I was recently watching a TV programme called “Amish: The World’s Squarest Teenagers”. The show took six Amish teenagers and slapped them into different British social groups each week. 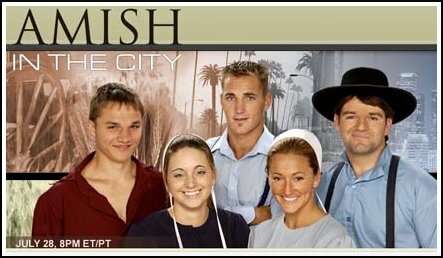 It was very similar to an earlier, American programme: “Amish in the City”. Both programmes followed the fish-out-of-water staple of ‘unscripted TV’ and were fairly unremarkable. So why bring them up? Because, observing the Amish encountering the modern world made me think. The Amish have a very simple way of life that is centred around following God and the Bible down to the very last detail. They are humble, simple, honest people who have no use for anything other than practical skills. They are home-schooled and only educated insofar as they need to provide for themselves. The teenagers on the Channel 4 programme had never heard of psychology, let alone anything contained within the subject. In many ways it is an admirable way of life. They don’t want for anything, don’t covet anything; at no point did any of the Amish seem as if they were dissatisfied with their lot. Contrast this with a society that is obsessed with money in thrall to the ‘invisible hand’ of the market, and where most people’s happiness is, however unconsciously, linked to the possession of material goods. Every time a happiness index report is released, the relative happiness of many ‘less developed’ nations is always highlighted, and rising depression and suicide rates amongst communities where television and other mod cons have first been introduced are not infrequently reported. Such reports are in keeping with Durkheim’s concept of anomie. Broadly speaking, anomie is a sort of existential angst arising from increasing individualisation: without a strong sense of belonging or purpose, such as is provided in more primitive societies both socially and theologically, the individual is set adrift. One need only observe the post-graduation, quarter-life crisis and later mid-life crises common in our societies to substantiate this. The Amish work to live. They worship God and live off the land. We in Anglo-American societies struggle to find meaning and definition to our lives. We have a sense that we must become someone, be someone, do something worthwhile. But ultimately, these are fallacies. We are adrift in an ever expanding universe that may or may not be part of a multiverse where we can only perceive 10% of all existing matter. And what’s worse is that we know it. I admire the Amish, but also pity them. They don’t have access to the same education we receive. They aren’t aware of all the magical, wonderful things that we are aware of. They don’t know about, or at least have much experience of, quantum physics, rock ‘n’ roll or the internet. They don’t know about any of the things that I love and that excite me. But are we any happier than them? And if the overarching purpose that we all struggle to define and find for our lives really is just a fallacy, then isn’t that all that matters in the end? It comes down to the old saying ‘ignorance is bliss’. Whenever anyone says this there is a certain shade of condescension as if to say: ‘look at those poor bastards; under-educated and happy’. But who smiles more? There’s no sense in agonising over your existential lot, and that is not what I intend to do. The question is simply this: is ‘progress’, and all its trimmings, really as great as we think it is? The problem with life is…it keeps getting bigger. I really like what you’re doing. I agree with most of what you say + like the way you’re saying it – not pretending to have a solution to everything or to know better.